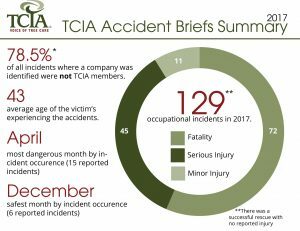 The Tree Care Industry Association (TCIA) learned of 129 tree care-related occupational incidents* in the calendar year of 2017. Seventy-two of them were fatal. The TCIA report provides what is known about these incidents from media accounts. 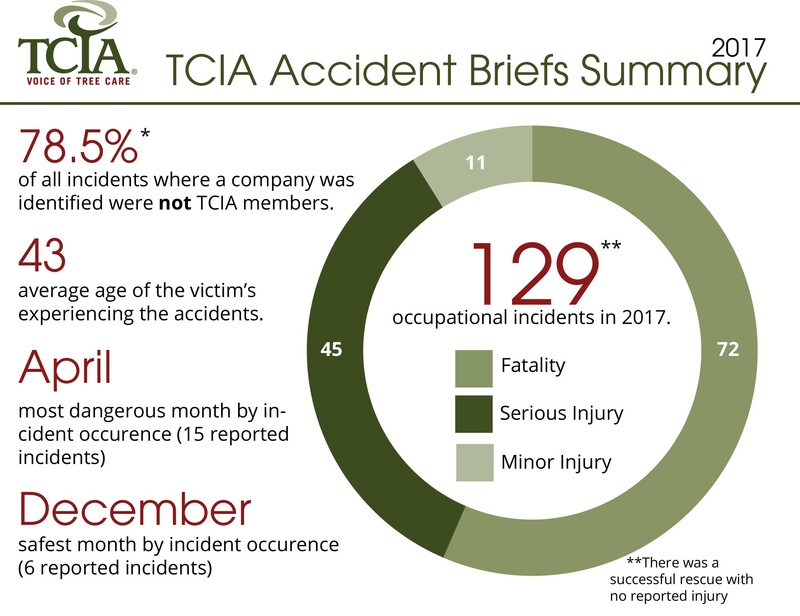 Comparing 2017 with previous years, TCIA reported 81, 92 and 92 occupational fatalities in 2014, 2015 and 2016, respectively. The youngest victim recorded was 20, and the oldest was 71. The average age of the victim (all incidents) was 43. This relatively high average age suggests that complacency rather than ignorance plays a significant role in these incidents, said TCIA. The typical electrocution victim violated the minimum approach distance and made contact through a conductive tool/object. For those accounts in which an employer was identified, 22 percent of all incidents occurred with TCIA member companies, and 78 percent occurred with nonmembers. The three primary types of accident causation are the same as they have been in recent years: Fall, struck-by and electrical contact incidents comprise 33, 33 and 17 percent of the total incidents, respectively. Additional information can be viewed here. *TCIA relies on media accounts of accidents for this data. Less newsworthy accidents are less likely to be recorded. TCIA defines an incident as “occupational” when it is clear from the account that the victim(s) was/were engaged in tree work for compensation.